On your second day here, explore the striking landscape of Crater Lake National Park. To find maps, traveler tips, where to stay, and other tourist information, you can read our Crater Lake National Park trip planning app . Vancouver, Canada to Crater Lake National Park is an approximately 8.5-hour flight. You can also drive. When traveling from Vancouver in April, plan for somewhat warmer days in Crater Lake National Park, with highs around 22°C, while nights are about the same with lows around 6°C. Wrap up your sightseeing on the 26th (Fri) to allow time to travel to Seattle. 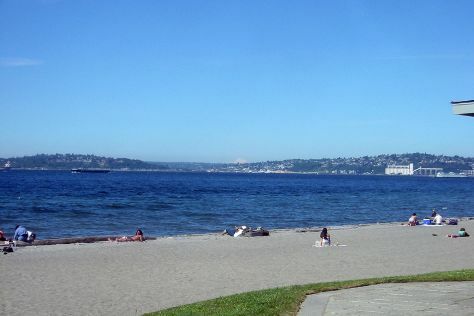 Start off your visit on the 27th (Sat): enjoy the sand and surf at Alki Beach, take a stroll through Pike Place Market, and then enjoy breathtaking views from Space Needle. On the next day, see the interesting displays at The Museum of Flight, look for all kinds of wild species at Mercer Slough Nature Park, then get a taste of the local shopping with Glasshouse Studio, and finally view the masterpieces at Chihuly Garden and Glass. For where to stay, other places to visit, photos, and tourist information, read our Seattle trip planner . You can do a combination of car and flight from Crater Lake National Park to Seattle in 5 hours. Alternatively, you can do a combination of taxi, bus, and flight; or drive. Traveling from Crater Lake National Park in April, you will find days in Seattle are a bit cooler (19°C), and nights are about the same (9°C). Wrap up your sightseeing on the 28th (Sun) to allow time to drive back home.